Arden’s community Clubhouse is set to open this summer, offering endless opportunities to exercise, entertain and explore. Arden’s Clubhouse is designed to take leisure and healthy living to a whole new level with plenty of gathering spaces and access to amenities. The Clubhouse will be the heart of Arden, acting as a social hub for residents of all ages. 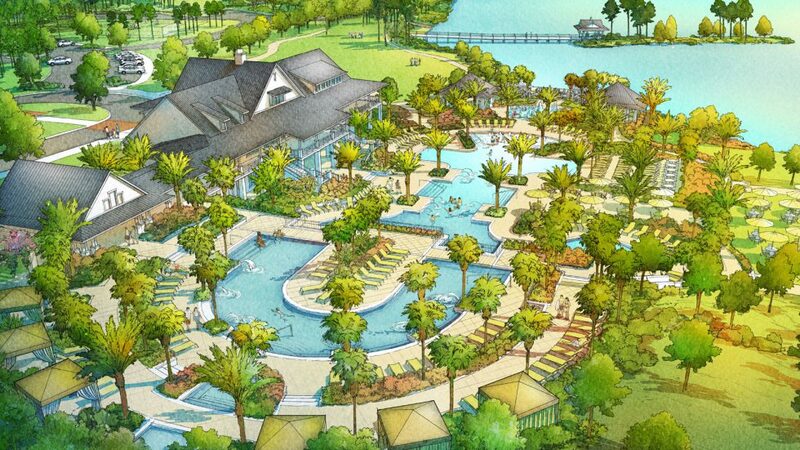 The first floor will cater to families and children with easy access to the pools, restrooms and Fitness Center. Just steps outside, the split-level resort-style pool will provide space for everyone, with a peaceful upper pool featuring shaded lounge areas and a fun-filled lower pool with an interactive splash pad. The second floor will feature vaulted ceilings and walls of windows that will create a tranquil space for residents to enjoy. A wraparound veranda that will overlook the pool will be the perfect spot for enjoying the sunset. The Arden Room will be ideal for larger gatherings like resident events, and the cozy cardroom will be just right for meeting with your monthly book club. The main floor of the Clubhouse will also be home to the Hub, an inviting coffee and snack bar that will provide the perfect place to socialize and revitalize. Complimentary Wi-Fi and plenty of comfortable seating will make it easy to enjoy your morning cup of coffee or to grab a snack and settle in to work remotely. Arden’s state-of-the-art Fitness Center will be located on the first floor of the Clubhouse, so you can forget about the hassle of having to drive across town to go to the gym or pay expensive membership fees. Featuring a variety of cardio and weight training equipment, you’ll have everything you need for your favorite workout routine. Plus, the private group exercise studio will be complete with Wellbeats™ virtual fitness classes available on demand, so you’ll always be able to fit a class into your busy schedule. Interested in learning more about the lifestyle and amenities at Arden? Join our Founders Club to be among the first to be invited to the Amenity Center Grand Opening, where you’ll be able to experience it all firsthand.